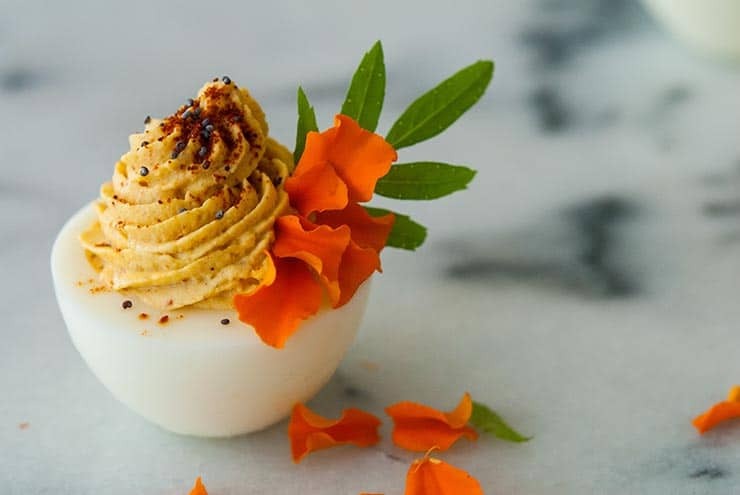 These gorgeous, spicy deviled eggs are delicately seasoned with chipotle chili pepper, cayenne pepper and Spanish smoked paprika and garnished with a few, bright, edible marigold petals – making them the prettiest appetizers at your next, colorful cocktail party! 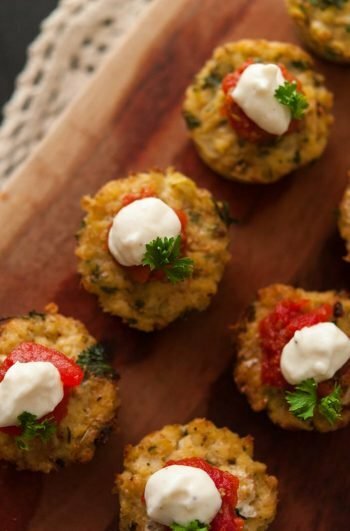 With a little spicy mustard and sour cream, these little beauties are full of zing, perfectly keto and can also be made without mayo. I’ve always been so inspired by the imagery and tradition of Dia de Los Muertos (The Day of the Dead). I love the beautifully painted sculls, bright colors, monarch butterflies and marigolds. I love the fearless, creative celebration of something so many of us fear the most. 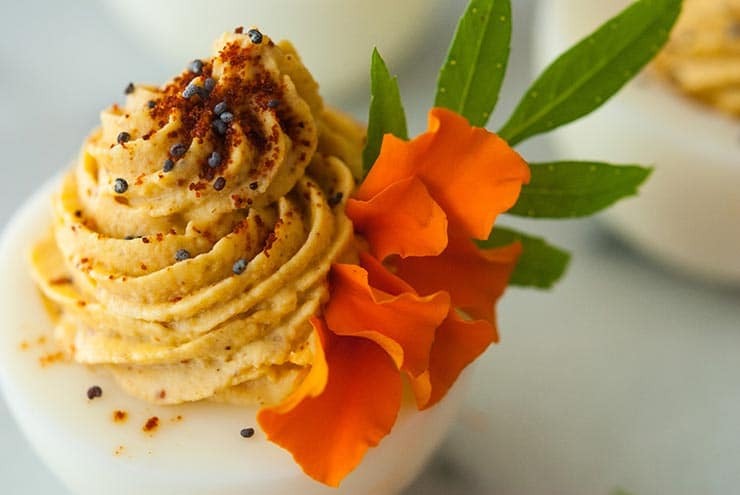 The bright color and smell of marigolds is said to guide the spirits of our loved ones to the alters that we’ve prepared for them, so I’ve garnished these lovely little appetizers with a few petals to draw a few sweet spirits to my kitchen. Make sure not to use too many Marigold petals as your garnish. 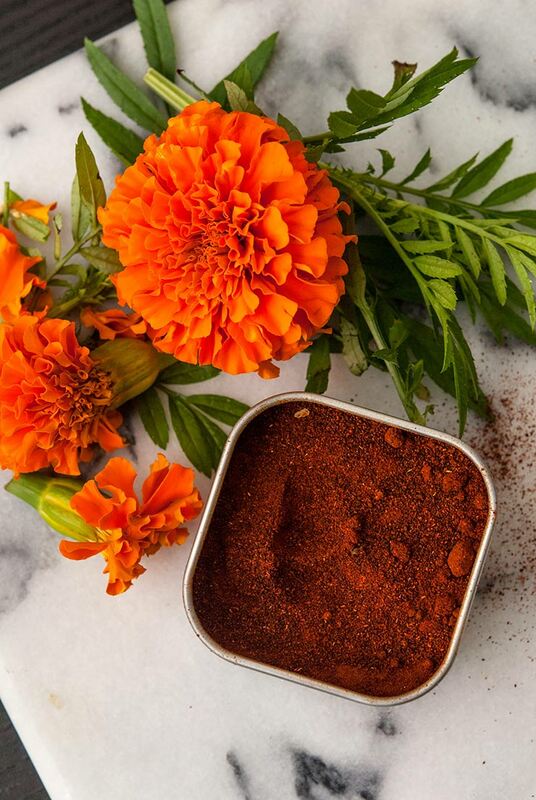 Marigolds are totally edible (and so pretty as a garnish), but you don’t want to use more than 3-6 teeny, tiny ones, as their aroma is quite strong. Make sure not to fill your eggs until a half hour, to an hour before you serve them. The filling tends to dry out and starts looking quite un-appetizing after an hour, even if they’re in the fridge. Just how spicy is this recipe? I would say it’s mild-medium spicy. Not toooo over the top. If you wanted to go spicer, you could up the cayenne, add a little hot sauce or even garnish with a few chopped Jalapeños! It’s all to your taste. You’ll find this recipe will be a tiny bit dry once you’ve added the ingredients so you can add more of whatever sauce you fancy. If it’s too spicy, add a little more mayo. If it’s not spicy enough, add some spicy mustard. 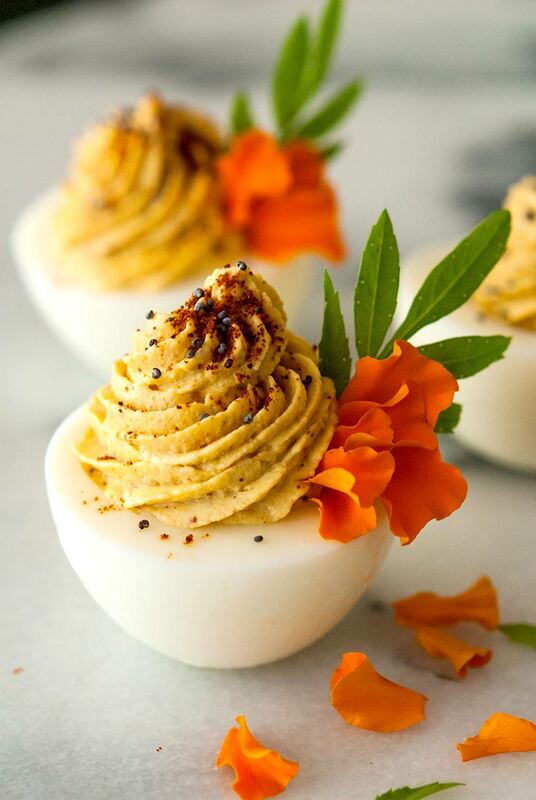 How far in advance can these deviled eggs be made? You can make them a whole DAY in advance! Once you cut your eggs and mix your filling, you can simply store it in a pastry-piping bag with the ends sealed with a rubber band, or in a plastic baggie over night (again, highly suggesting a pastry-piping bag because it makes your eggs SO much prettier). 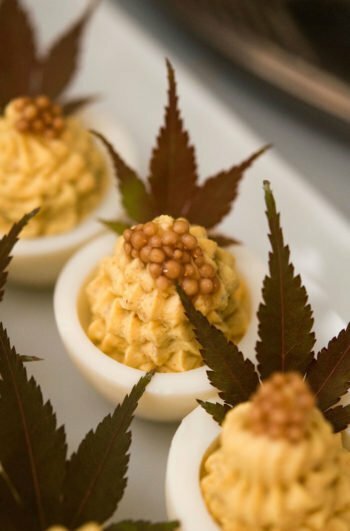 Are these deviled eggs ketogenic? 12 of these eggs have less than 4 carbohydrates total, so they’re QUITE keto-friendly. Can they be made without mayo? Yes! Just use only sour cream, instead of both sour cream and mayo. They’ll have a bit more zing than if you combined the mayo and sour cream, but not too much of a zing to be any less delicious. What is needed to make them? 8. In a small mixing bowl, mix your egg yokes, ½ tbsp. mayo, ½ tbsp. sour cream, 1½ tbsp. spicy brown mustard, ⅛ tsp. cayenne pepper, ⅛ tsp. chipotle pepper and a dash of Spanish smoked paprika. Your consistency should be similar to hummus so give it a taste, and see which sauce you would like to make it a bit more creamy. If it’s a little too spicy for you, add a little more mayo. If it could use more zing, add a little more mustard, etc. 9. Once your ingredients are mixed, add your mixture to a pastry piping bag with a nice tip and fill your pretty, little eggs. 10. Sprinkle your eggs with your spice of choice, but always pour it into your hand first and sprinkle onto your eggs. If you sprinkle from the container, you risk sprinkling too much. Garnish with a few tiny petals and your beautiful creations are ready to serve. Make sure to save a few for the sweet spirits coming to visit you. 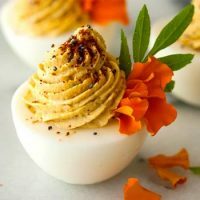 Help Yourself to These Other Floral Deviled Egg Recipes! 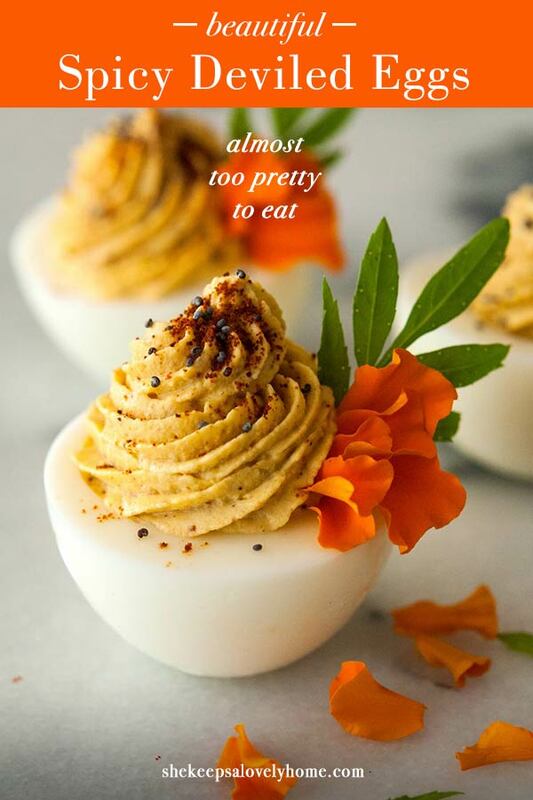 These gorgeous, spicy deviled eggs are delicately seasoned with cayenne pepper, Spanish smoked paprika and chipotle chili pepper and garnished with a few, bright, edible marigold petals – making them the prettiest appetizers at your next, colorful Autumn cocktail party! Add 6 eggs to a pot of cool water, then place them on the stove and boil them for 25 minutes. Once boiled, place them in a bowl of cold water for 10 minutes. Refrigerate for 1-2 hours. Slice them carefully in half through the center. Slice a little bit off the bottom so they sit flat on a surface without sliding around. Remove the yokes by simply sliding them out, or using a very tiny spoon, making sure to keep the whites free from rips or dings. Set them aside. Push the yokes through a mesh strainer into your mixing bowl. 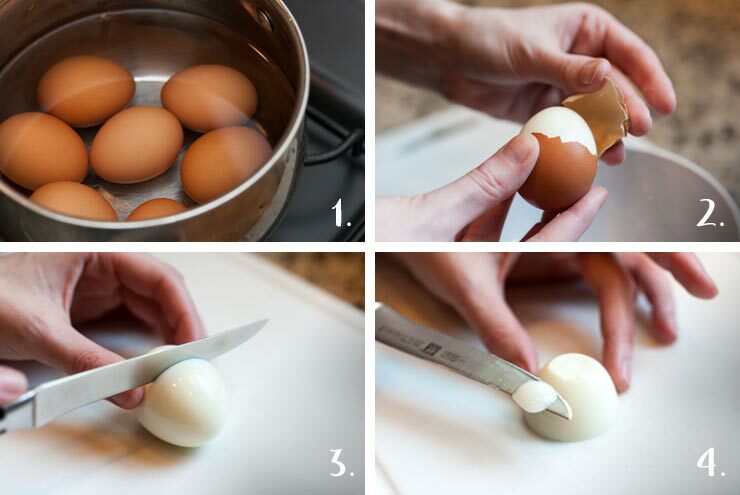 This will ensure your egg filling is creamy and smooth without any eggy chunks. 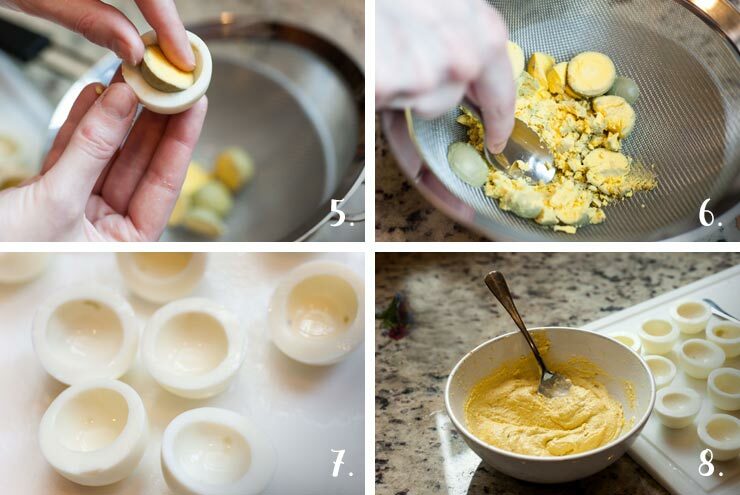 Mix your egg yokes, ½ tbsp. mayo, ½ tbsp. sour cream, 1½ tbsp. spicy brown mustard, ⅛ tsp. cayenne pepper, ⅛ tsp. chipotle pepper and a dash of Spanish smoked paprika. Your consistency should be similar to hummus so give it a taste, and see which sauce you would like to make it a bit more creamy. If it’s a little too spicy for you, add a little more mayo. If it could use more zing, add a little more mustard, etc. Set aside. Wash and dry your egg whites with a paper towel so they're perfectly tidy and picture perfect. Add your mixture to a pastry piping bag with a nice tip and fill your pretty little eggs. Sprinkle your eggs with your spice of choice, but always pour it into your hand first and sprinkle onto your eggs. If you sprinkle from the container, you risk sprinkling too much. Garnish with a few tiny petals and your beautiful creations are ready to serve. Make sure to save one for a sweet spirit.